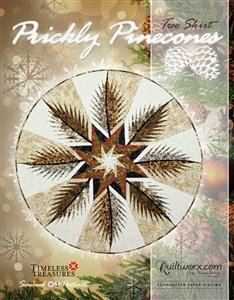 The Prickly Pinecones pattern was designed by Judy and Brad Niemeyer in the Spring of 2015 to show off the rustic elegance of Judy and Judel’s fabric collections, Reclaimed West and Seasonal Portraits. It was designed to mimic frosty pinecones, a wintery landscape and wrap your Christmas tree in the warmth that comes from a cozy fire, with reminders of the smell of a fresh pine tree. This pattern is the first design in our collection of patterns to teach one of Judy’s latest innovative techniques, the basted registration point. You’ll never misalign large units again using this approach! Cut a hole in the center or place a tree on top…or just use it as a wall hanging or table topper! No matter what you do, the perfectly spaced spikes, rich, chocolate and vanilla color palette, and log cabin center star are sure to make your Christmas Celebration just a little more inviting! We are sure to have one under our tree this year!